Hydrangeas are a joy for many gardeners and can quickly fill and brighten most any area of the garden. Grow hydrangeas in pots to enjoy them up close. 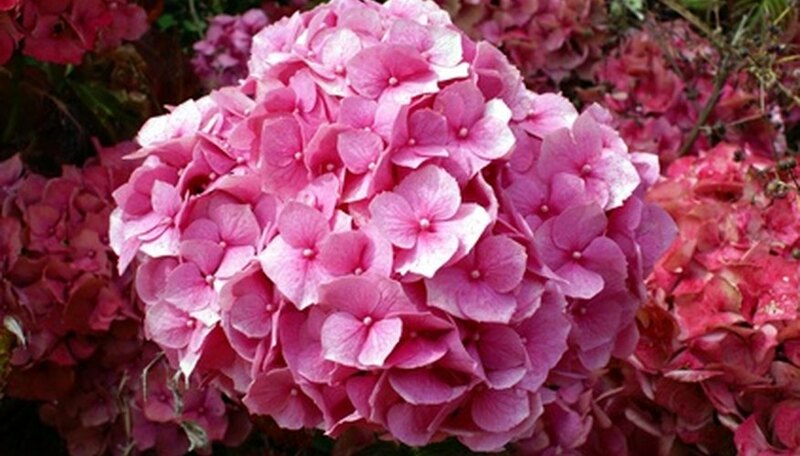 Start with the appropriate small hydrangea variety, such as Annabelle, Oak leaf or PeeGee. With healthy plants, regular care and watering, a display of large colorful blooms will grow on a deck or patio. Select a large pot for the hydrangea that measures at least 18 inches in diameter. Add 1 to 2 inches of gravel before pouring in enough potting soil to fill the pot halfway. Remove the pot from the hydrangea and untangle any roots that are circling around the bottom of the root ball. Set the hydrangea into a large pot. Adjust the amount of soil under the plant to make the top of the root ball about 1 inch below the rim of the pot. Fill in any open areas between the rootball and the inside wall of the pot until the pot is full. Water the soil evenly to make it moist. Place the hydrangea in an area that will receive full sun in the morning but a shaded or less direct sun in the afternoon. Place the plant in full sun throughout the day so long as you are vigilant about watering if no shaded or indirect sun space is available. Water the potted hydrangea when the soil feels dry 1 inch below the surface. Plant in the spring, preferably, as buds begin to swell on the stems. Feed the hydrangea 2 to 4 oz. of a slow-release, granule fertilizer per foot in height. Verify with the fertilizer's packaging for more specific application details. Clip off dried blooms and cut away dead or old wood at the soil level. Move the hydrangea in the winter to an area protected from wind and cold temperatures. Set the plant against a wall to block wind and add a few degrees of warmth or wrap the plant with burlap. Start with a cultivar that is known for growing well in containers and matches the climate of your region. After about five years in a container, the hydrangea should be transplanted into the ground or divided into at least two plants.